Good Monday Morning! After a wonderful birthday party last night, I have the morning update on the Famine and Red Eye fires. The forest service reported that they have several new crews on the fire, from Wyoming, Texas, Michigan and Minnesota, of course. They will be able to do some air suppression, and they have crews on the ground who are starting to dig fire line around the perimeter of the fire. Someone asked if everything is under control. The reply was that the steps toward control are such: initial attack, containment, control, and finally, mop-up until it is out. Currently, the fire fighters are in the second phase, and they hope to have some numbers later today as to how much containment has been achieved. I think it is fair to say that while the fire itself is not under control, the response and work effort are definitely under control. Things are moving forward, the weather is cooperating, and life is moving along mostly as usual. That means that Paul and Addie Will have to continue their schoolwork today, unlike on Friday afternoon after the evacuation order was called! Friday afternoon was a little strange. We had been having a wonderful time on an absolutely beautiful day, making pizza in the oven outside, when a Gunflint Lodge employee informed us that the evacuation had been called. We were puzzled, and turned on the radio, to hear the official order. You know that radio test of the emergency broadcast system? Well, we heard that, and then a recorded voice verified what Adam had already told us. I went to Birch cabin to let the folks know, and while we talked, I told them that I really didn't know what else to say, since I had never been evacuated before. They began to pack up, and I went back to the lodge to answer the phone and keep out of trouble, as my dad always says. Greg and Paul sprung into action, and immediately fired up our fire truck. 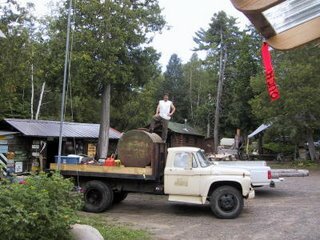 They brought it down to the dock, and soon the pumps were running and Paul was spraying water on the trees and sauna. Addie was helping me in the store. When the sheriff came by, we had our first indication of exactly where the fire was burning, and it was then that I knew that we would be okay staying for the night. It was also at that point that we learned it was a cautionary, rather than a mandatory, evacuation. As our other guests came in off of the lake, we told them all that we had learned. Some of them decided to stay for the night, and others chose to leave. The largest factor we were dealing with then was the smoke, and most of those who left did so because of that. By five, the evacuation/fire truck prep had quieted down. We gathered at the bread oven and started to make pizza in the oven again, for ourselves and guests for dinner. It was a great evening, too, as the smoke wasn't too thick, and the pizzas tasted great. One of the oddest parts, though, was the total quiet. We could hear the airplanes in the distant south, but there were no boats on the lake, and almost no road noise. When we heard a truck coming down the road, we were surprised. Turned out to be the Forest Service. Then our neighbors Tim and Mo came to bring us the produce cooler, and to join us for dinner. We sat out as the darkness fell, and it was a nice evening. 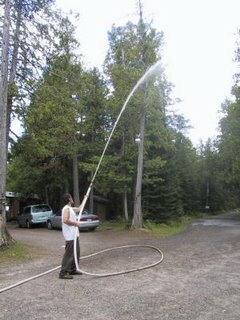 Greg is shown here testing the spray from the fire hose. Well, now it is Monday evening, and I am finally getting back to finish this post. I can give you the evening update for the fire, too. The day was cool and drizzly, and many planes flew over our lodge. Each time I ran out with the camera, they went by too quickly. I'll try again tomorrow. The report tonight put the acreage for the Famine fire at 4044 acres, and the Red Eye fire at 1792 acres. The Famine fire is considered 5% contained. The good news continues. This week sounds like we will continue with cooler, wetter weather, but there may be a warm-up after that. We continue to be vigilant with our use of campfires and the bread oven, and we hope that everyone else out there is cautious, too. I'm working towards answering my emails--thanks for writing to us! I should be able to answer in the next day or so.